Police in Taunton are investigating a hammer attack on a 96 year-old war veteran. Jim Booth was left with serious head injuries after answering the door of his home to a caller offering to do work on his house. The family of a 96 year old D-Day veteran from Taunton say he is "not easily defeated" after he suffered severe injuries in an attack at his home. Jim Booth was left in a life threatening condition in hospital following the incident on Wednesday. The decorated war veteran played a crucial role in gathering information ahead of D-Day. Police have arrested a man on suspicion of attempted murder and aggravated burglary. “Our father is an exceptional person of whom we are all immensely proud. He is the head of the family, a dearly loved father to his four children and adored by his grandchildren and great grandchildren, to whom he’s simply known as ‘The Legend.’ He is, and always has been, our own family hero. “The police have worked tirelessly to track down the suspect of this vicious and cowardly attack and we are grateful to them for their thorough investigation and also for their support to the family throughout our ordeal. “We recognise that the police and medical staff who have been involved have been deeply affected and we want to thank them, on our father’s behalf. “Countless friends, neighbours, members of the community and even strangers, have expressed their shock, incomprehension and outrage. We acknowledge and share those feelings. “However, our father is not easily defeated and he grows a little stronger each day. We are all now focused on the long process of recovery, which will be helped by the love and support of all those around him. War veteran Jim Booth has been seriously injured after being beaten with a hammer at his home in Taunton. He has been described as a 'secret hero' of D-Day. In his later years, the 96-year-old has made some famous connections. In August 2015, Jim Booth joined the Prince of Wales and Duchess of Cornwall for a reception in the grounds of Westminster Abbey. 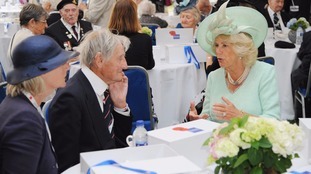 During the party, which was hosted by the Royal British Legion, Mr Booth took to the floor for a dance with Camilla. Jim Booth, the 96 year-old man recovering in hospital from a hammer attack at his home in Taunton, had a distinguished military career. Sub-lieutenant Jim Booth was a member of the Combined Operations Pilotage Parties whose members risked their lives to gather information about proposed landing beaches and inshore waters, usually under the noses of enemy coastal defences. Mr Booth is the only survivor of a crack 10-man team who spent five days half a mile underwater in two mini subs X-20 and X-23 before the D-Day invasion of 1944. The daring operation helped guide Allied landing craft to Sword beach instead of drifting on to jagged rocks. He was awarded the Croix de Guerre by the French for his outstanding gallantry. Following the success of the D-Day mission Jim was posted to the Far East to carry out further hazardous reconnaissance work along the coast of Burma, prior to its recapture. This entailed exploration of the coastal inlets, using small specialist landing craft, and sorties from two man canoes, which were launched from submarines. After his Far East tour of duty, Jim returned to the UK to attend a parachute course, but he was then returned to the regular navy, and sent to the Mediterranean in command of a minesweeper, HMS Vallay, clearing German minefields. Before joining COPP Jim had served on the North Sea convoys. “When you’re a young man, and part of a good team of like-minded extroverts, you just think it’s all an exciting adventure, and you never imagine that you might not survive”. The vicar of Jim Booth's local church says he's 'still the same old Jim' despite the horrifying hammer attack on the 96 year-old. The Rev Stephen Kivett spoke to ITV News after visiting the D-Day veteran in hospital. Mr Booth suffered serious injuries to his head and body when he was attacked two days ago at his home in Gipsy Lane, Taunton. A 39 year-old man has been arrested on suspicion of attempted murder and aggravated burglary. A man has been arrested in connection with a hammer attack on a 96 year-old D-Day veteran at his home in Taunton. Jim Booth was left with serious injuries to his head and body when he was assaulted at his home in Gipsy Lane two days ago. This morning police arrested a 39 year-old man on suspicion of attempted murder and aggravated burglary. Mr Booth is being treated at Taunton's Musgrove Park Hospital where he is said to be in a serious but stable condition. The vicar of his local church told ITV News that Mr Booth was now talking and eating. Rev Stephen Kivett, vicar of St John's and Staplegrove, visited Mr Booth last night. The detective heading the investigation into the hammer attack on a 96 year-old war veteran has described it as horrific and terrifying. Jim Booth suffered serious head injuries when he was battered with a claw hammer at his home in Taunton two days ago. Mr Booth was visited at Musgrove Park Hospital last night by the vicar of his local church. Rev Stephen Kivett from St John's in Staplegrove told ITV News that Mr Booth was able to talk and eat. Initial reports had suggested his injuries were potentially life threatening.